Have you been injured in an airport? We’ll get you the compensation you deserve. If you have ever traveled through the Hartsfield-Jackson Atlanta International Airport, you know the potential for accidents is everywhere. Not only is it a quickly moving, crowded environment, there are inherent risks involved with picking up your bag from a rotating, metal machine, or boarding a train to dart from one terminal to the next. There are elevators and escalators everywhere, as well as trucks and carts flying through the crowds. The floors of the gates and concourses may not be free from obstacles, debris and other hazards. The Atlanta airport can be a very dangerous place. 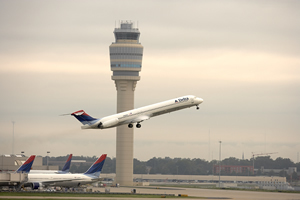 There are approximately one million people who travel through Atlanta Hartsfield airport each year. With this many people, accidents are bound to happen. Atlanta’s Hartsfield-Jackson Airport is known as the world’s busiest airport. In 2011 alone, it served approximately 92 million passengers and almost one million flights. If you have been injured in an accident of any sort at the Atlanta Airport and would like the advice of an attorney regarding your situation, contact us today. We have achieved significant results on behalf of previous clients in handling Atlanta Airport injury cases. Slip and falls are one of the more common types of accident which occurs at the airport, usually due to the fact that people are rushing to get to their flight. There are many potential hazards for a slip and fall at the airport, such as moving sidewalks, fast moving trains, and steep escalators. There may also be areas of uneven flooring that are not marked as “Use Caution”. If there are hazardous conditions that the airport has not corrected, then airport management or the City of Atlanta may possibly be held responsible for your injuries. The food court areas at the airport are hazardous because people are eating in a hurry to make their flights on time and may not dispose of their trash properly. There may be food wrappers on the floor, which are easy to slip on. There also may be soda spills or other slippery substances such as condiments. Injuries have also been known to happen in the Jetways. If there is too much space between the end of the ramp and the door to the plane, children or the elderly can get stuck in this gap and injure themselves. If you are injured in an accident at the airport, the first thing you should do is to file an incident report. Before you continue on with your travel, make sure that you obtain a copy of this report. You should also take pictures of the area where the accident happened, and make detailed written notes. The more evidence you are able to gather, the stronger your case will be. The deadline for filing a lawsuit in Georgia is two years from the date of the incident, but you need to retain an attorney as soon as possible so that they can begin working to make sure the evidence in your case is preserved and not destroyed. For years, The Bennett Law Group has successfully represented clients who have suffered personal injury at the Atlanta airport. It is a specialized area of law and requires specialized knowledge to navigate. If you need an Atlanta airport lawyer who not only claims to know the laws surrounding these personal injury cases but also has the history to back up that claim, please contact our firm to discuss your circumstances. Contact us online or call us at 404.541.9330. We look forward to assisting you with your case.